To me, one of the most interesting thing about Foursquare is the History tab. It transforms the service from a “where you are” app, into a “where you were” log. In a way, it’s sort of like a diary. I wish Twitter was better at this idea as well. Because what I tweeted a year ago says something about how I was feeling, or what I was doing back then. In fact, a lot of the web services we use on a daily basis would be perfect for this type of passive diary writing. And that’s exactly what Momento, an iPhone app, makes happen. 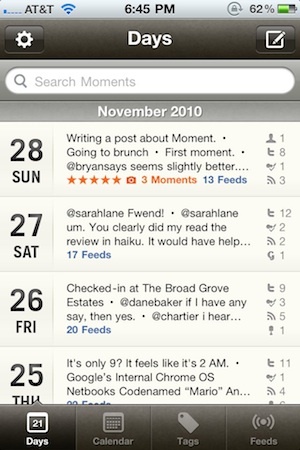 At its core, Momento (made by the UK-based d3i) is a straightforward diary app. 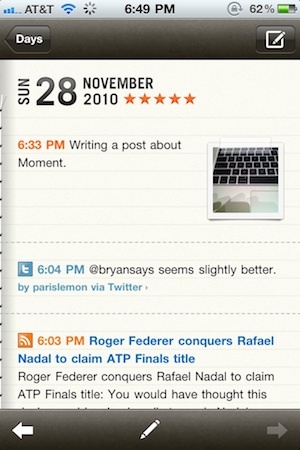 It allows you to easy write “Moments” (diary entries) to express what you are doing or feeling on any given day. It takes the process a step further by allowing you to tag friends (from you iPhone contact list), places, events, and add photos to these entries. 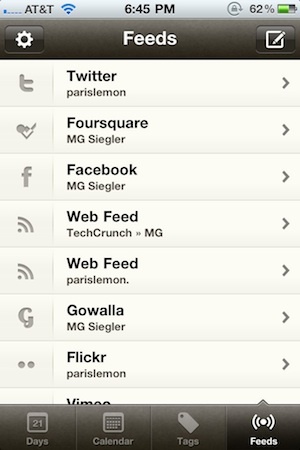 But the real killer feature of the app is that it also allows you to import bits of information from a number of services including Twitter, Foursquare, Gowalla, Facebook, Flickr, YouTube, Vimeo, Digg, and any RSS feed. The result is a brilliant log of almost everything you’re doing online. Other services have tried to do similar things before, but Momento works because they’ve nailed the user interface and experience. The entire app looks like a journal, which is broken down by days in descending order from the current day. In this view, you get a snapshot of any given day, including the most recent items (tweets, check-ins, etc). Clicking on any of these days takes you to a detail page which shows you all of your activity for that day. All your tweets, check-ins, blog posts, pictures, etc, are here. There’s also a calendar view which allows you to quickly hop to any moment in the past. Clicking on a date will again take you to a specific day page with all of your info with what you did that day. Another view allows you to see entries broken down by tags. From here, you can choose to see only entries with certain people tagged. Or you can see only entries that you gave a high rating to (when you make your own Moments, you can rate them if you want). There’s also a way to see just certain types of elements, such as tweets. Again, these are broken down by the day they were sent. And what’s really awesome is that you can search all of this stuff if it has been imported into Momento. The key to Momento is that all of this information is for you and you alone. You import social items, but it never sends anything out. It’s simply a way for you to log and keep what you did on any of these services in a given day. And it’s all presented in a very nice, easily accessible package. It’s another of the anti-social social apps, like OhLife and the newer Path, which seem to focus more on what experiences mean to you (or a very small group of friends), rather than to strangers and the larger web as a whole. With the personal approach in mind, Momento also comes with an impressive way to both backup and export all of your data (this is accessed through iTunes file sharing). Momento also comes with some nifty importing options to better tailor you data. For example, you can tell it to leave out tweets with a certain hashtag. Or you can tell it to only import tweets with a certain hashtag. You can tell it to leave out @replies and/or retweets, etc. Momento actually isn’t a new app; it first came out about a year ago. But version 2.0 was recently released, and with it comes a huge number of excellent improvements including all the geolocation service integration and the video service integration. Both of these features are pretty key for a full and interesting social service diary. Simply put: I love this app. I think it’s a near-perfect execution of a very compelling idea: passive diary writing. The downside is that it currently only works with the iPhone/iPod touch/iPad. But if you have one of those devices, this app is well worth its current $1.99 price (that’s a limited-time price). Find Momento in the App Store here.